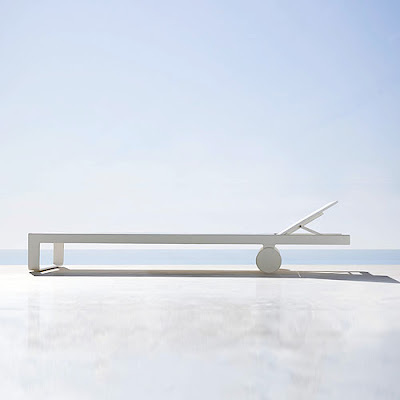 The Flat Chaise Lounge was designed by Mario Ruiz for Gandia Blasco in Valencia. Mario Ruiz created the Flat series to complement and enhance the contemporary collection of outdoor furniture already existent at Gandia Blasco. The sleek and slender lines add style and a serene sophistication to any outdoor space. The reclinable backrest adds to comfort. 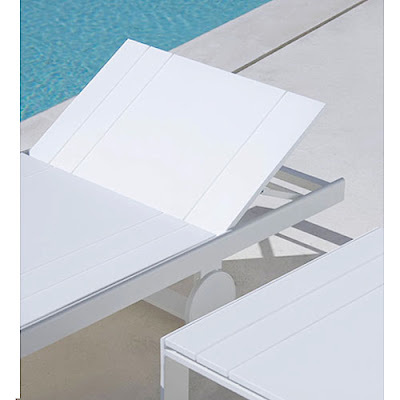 A pool side, beach side or a patio setting would be dressed up by the Flat chaise lounger. The Gandia Blasco Flat chaise lounge is available in two heights and two color options (white or bronze). The chaise lounge cushion is sold separately and is also available in the two color options.